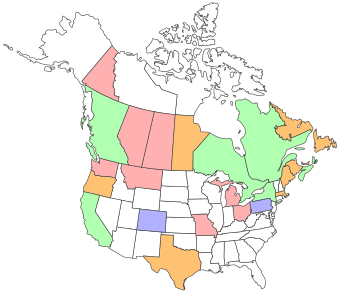 Teena found a site called Create Your Own Visited States and Provinces Map, which she did for herself and posted. I have done a map for countries that I have had beers from, so decided it would be fun to make this map one which shows the number of breweries I have had beer from for each State and Province. Red is for states/provinces where I've had beers from just one brewery. Judging from the large number of white area's, I still have some work to do!